Do you own a number of rugs in your house? There’s no denying that a rug can really add some character to the room and give a great overall sense of colour and vibrancy. Rugs can vary in price from modestly priced to very expensive. The basic starting price for a handmade Persian rug can range anywhere between £1,000 – £5,000 so it is very important that high-quality rugs are taken care of and cleaned with the proper technique. Original Persian rugs for instance are made from materials like silk and wool and contain very delicate dyes which if treated in the wrong way can be permanently damaged. Wrennalls group have cemented their place in the market as the most capable rug cleaners in Preston. With decades of experience and access to some of the most innovative cleaning technology on the market, we can offer you a rug cleaning service unmatched by anyone else in terms of quality, care and value for money. There are many things one must consider when cleaning a premium rug and they may come as a surprise. A low temperature is essential when cleaning rugs that contain lambswool as this material is prone to shrink when exposed to certain levels of heat. When cleaning your rug we will use a lower mid temperature that will lift dirt, dust and grime from the fibres of the carpet but without damaging it. A warped carpet does not look attractive or appealing but unfortunately, this is a possibility if your carpet is cleaned at a high temperature. This is the same for silk carpets which if washed at too high temperature will appear brittle and lack the sleek smooth feel that makes them so desirable. Shampoos are essential for not only cleaning out dirt but also revitalising and renourishing the precious fibres of a valuable rug. Many high-end rugs, especially of the Persian kind, are made with delicate dyes with will run if treated with the wrong kind of shampoo. 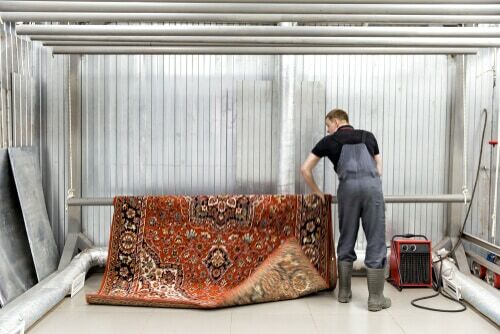 If you live in Lancashire and have a silk rug that requires cleaning, we strongly recommend that you seek out professional rug cleaners in Preston such as Wrennalls. Our experienced team utilise a range of natural specialist shampoos which have a perfect PH level rating and will not harm or distort the fine silk fibres or bleach the dye colouring. High-quality rugs are not merely decorative items but more like wonderous pieces of art which need to be treated with the utmost care and attention. If you are looking for experienced rug cleaners in Preston you need to be sure that they have a track record and understand the intricacies involved in cleaning and preserving such fine rugs. If you require the best commercial rug cleaning Preston from the industry experts, give Wrennalls a call on 01254 367 591</ or get a free quote from our website today!